George (Richard Gere) has run out of options. With nowhere to turn, he heads to Bellevue Hospital, New York’s largest homeless intake center located in Manhattan. He begins speaking with a counselor. He befriends a fellow resident, Dixon (Ben Vereen), who seems intent to insinuate himself into the newcomer’s life whether he’s open to the idea or not. Finally, George also begins putting out feelers as to whether or not his estranged bartender daughter Maggie (Jena Malone) might be open to seeing their relationship repaired, doing a variety of little things to let her know he’s eager to be part of her life. 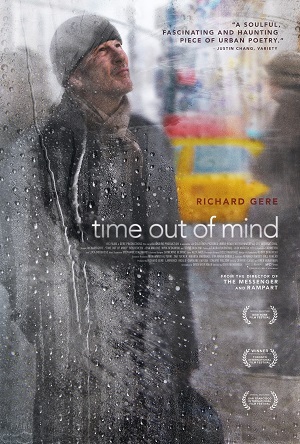 Giving a tour de force performance unlike just ab out any other in his career, Gere is the chief reason writer/director Oren Moverman’s (Rampart) latest Time Out of Mind is worthy of a look. A totally immersive descent into invisibility, George is the definition of a lost soul who refuses to admit he’s vanished off of society’s radar. He will not admit he is homeless. He will not admit he needs help. He’s barely willing to admit any faults whatsoever, including that the deterioration of his relationship with his family, chiefly that with his daughter, was of his own design. Gere is not a movie star as George. All of the ticks and tricks we’ve associated with him, from Looking for Mr. Goodbar, to American Gigolo, to An Officer and a Gentleman, to Internal Affairs, to Pretty Woman, to Unfaithful, are on display. In many respects, this is the most ethereal, the most naked, the most raw the actor has maybe ever been, the only real comparison I can make his early star-making turn in Terrence Malick’s Days of Heaven way back in 1978. Of course, the movies themselves couldn’t be any more unrelated even if what Gere is asked to do and accomplish in some respects is eerily similar. 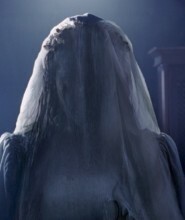 In both films, he’s asked to become an almost temporal figure, a ghostly specter walking through the proceedings around which momentum coalesces around. Yet, while in Malick’s farmland epic he is the object of carnal longings and passionate love fueling a triangle that will lead to fiery tragedy, here he is faceless drifter reacting to being forced to wander the streets in hopes of nothing more than a warm place to spend the night. It’s a stunning performance, one the actor will certainly add to the highlight reel, and as a showcase for him and him alone the film is nothing short of sensational. Not that this makes Time Out of Mind equally masterful. While I respect a lot of what Moverman is attempting, while I love how clearly the filmmaker has researched his opus and attempted to achieve a level of verisimilitude that’s documentary-like in its exactitude, it’s hard to fully grasp what the point of all of this ultimately might be. The film is almost too observationally dour, too emotionally stunted, and as such generating feelings other than those of disgust as to how easy and effortless it is to marginalize so many of our own citizens into unrecognizable insignificance there’s oddly not a lot to hold on to. Even the central melodrama brewing between George and Maggie is too reserved and subtle for its own good, and while I respect the approach I’m not entirely certain it’s as effective as Moverman intends. Yet the film is just too well made and acted to be dismissed so casually. In fact, one could make a solid case that, not only is Gere excellent, but Vereen is as well, the veteran star of stage and screen so powerful in his small but pivotal role he’s borderline Oscar-worthy. At the very least, he disappears so completely inside of Dixon I didn’t even realize it was the legendary Tony Award-winner playing the part. He and Gere have spectacular chemistry, watching them learn how to communicate one to the other a chief joy the motion picture offers up for audience examination. Not that joy is probably the right word. There is nothing light about Time Out of Mind, nothing simple. This is a dank, dark and, a small, winsome note of hopefulness in the climactic image aside, depressive drama that rarely makes an attempt to shimmer any light or levity in George’s general direction. Still, even if it is more polemic than it is straight-ahead narrative storytelling, more interested in making a point about homelessness in America than it is in deftly exploring the interiors of its characters, it’s just so well made and acted this is hardly a negative. As tough to watch as it might be, Moverman’s latest is compelling every step of the way, the heart of darkness looked at in the most meticulous detail arguably the viewer’s own.